The 2018 K2 Happy Hour has had a big revamp for 2018 and it sure rides well as a result! Gone are the pointy nose and tail to save weight, the board goes back to standard camber between the feet with a slight rocker in tip and tail thanks to Tweekend. The tweekend means the full length of the board is a usable surface area so when you butter you can press right to the tip, when you ride powder the area is used to push snow out of the way, clever hey!? 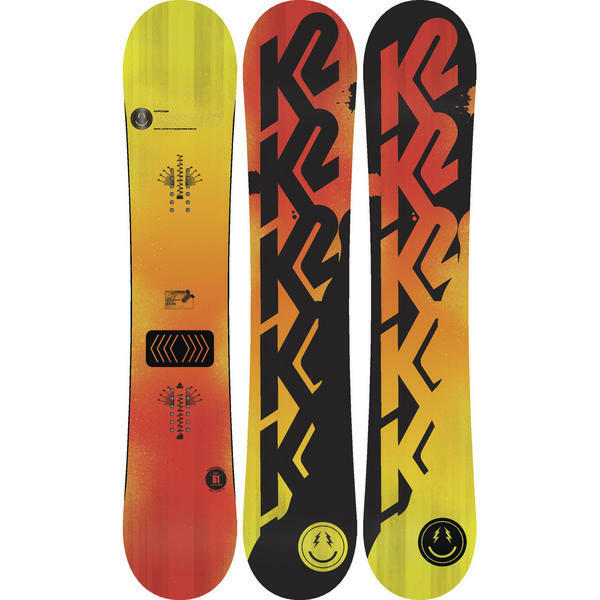 K2 throw a carbon ollie bar, ICG glass 20 and carbon torque forks to make this board a lively freestyle stick without going crazy on the flex scale and making it too stiff (6/10). This is achieved by laying the 20 ICG glass stingers tip to tail along with the Ollie bar making the flex smooth then carbon torque forks transfer power to the contact points quickly. Ollie higher, press better and spin faster with the all new Happy Hour. Ollie Bar - Loaded Ollie power! Carbon and kevlar pre curved bar for means pop for days!